Today, we will explore an open-ended straight draw (OESD) played at live $2/$5. Dan was nice enough to send this hand in…so let’s check it out. The action is folded to Hero in the cut-off who opens with 9s7s and before I even get into the hand I have a couple of observations. Why are you sitting $300 deep in a $2/$5 game, particularly when there’s a fish at the table with a $500 stack? As I’ve mentioned before, most players simply have a better strategy for 100bb than 67bb or some other weird stack depth. 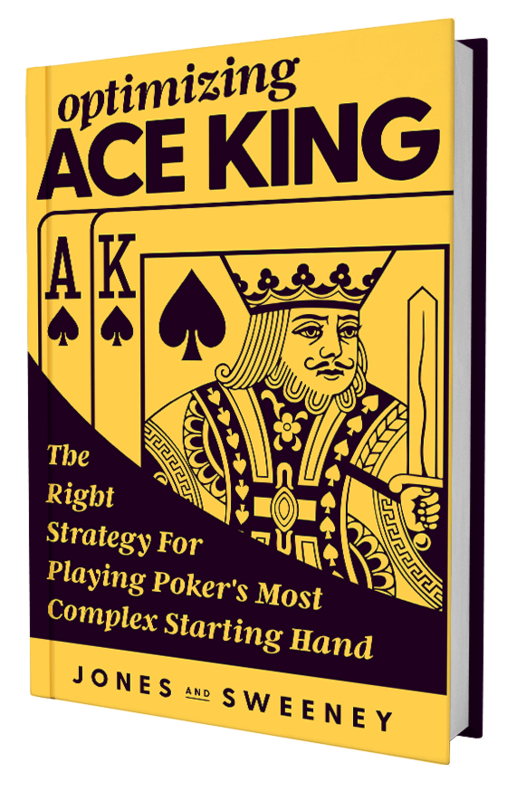 To some extent this just reflects the fact that a lot of poker books and training videos are based on 100bb stacks. Apart from the money you can leave on the table, why create a situation for yourself for which you’re less well prepared? Back to the hand. We get called by a LAG to our immediate left and go heads-up to the Tc8d2h flop, which gives us an open-ended straight draw. We fire $24 into $37 and the LAG makes a small raise to $56. Hero decides to call. Most people analyzing this hand would simply move on to the turn action, but I think the critical point in this hand is right here. In general, when you review how you played a draw, always look at the EV of taking an alternative line. The shallow stack sizes in this hand are extremely important when considering the flop action. Because of the shallow stacks, we are closer to a commitment decision on the flop than we would be ordinarily with 100bb starting stacks. The alternative to calling here is to reraise. How do we analyze the EV of such a line? The best approach is to use a tool such as the free fold equity calculator from RCP. This will tell us if it’s better to 3-bet or flat based on certain assumptions. The first three numbers we need to plug in are simply given by the bet and stack sizes, so the only additional information we need is our equity when called. Note that even if we 3-bet an amount less than all-in we are committed to this hand, so the money is going in and we thus use remaining effective stacks for the calculation. To a first approximation we assume that whenever we complete our draw we’ll win, so we can use the 4-2 rule here meaning our eight outs give us 32%. We then nudge that down a bit to 30% since when called we’ll sometimes be up against hands like two-pair that can boat up against us even when we make our straight. Putting in these numbers, the FE calculator tells us that we break even if villain folds 40% of the time. In other words, if we shove here and our opponent folds 40% of the time, the play is 0EV. If our opponent folds more than 40% of the time we profit. Many players do not play their draws aggressively enough and will call in this spot. Even if it turns out that calling is a reasonable play, you will get better at poker if you constantly ask yourself if a more aggressive line would be higher EV. 1. What does the $56 raise mean? 2. How often do hands from that range fold? I think that the average LAG – and the player type is super important here – makes this play with hands they are not super comfortable with. Maybe it’s an 8x trying to figure out where it’s at or a QJ that’s trying to get a free turn card. Basically a lot of hands that raise small aren’t going to be that strong simply because there aren’t that many strong hands available. Let’s break it down. Does a LAG call or 3-bet TT preflop here? Even if they call that only gives nine total combos of sets and two realistic combos of T8s for two pair. That’s a total of eleven combos of strong hands. So now the question becomes, how many combos of hands like 87 or 76 that the LAG would raise fold here? If we can find just eleven we’ve got 50% fold equity and we’re safely in the regime where our 3-bet is +EV. If you think the LAG’s raising range hardly ever folds, clearly a bet-call is best here to enjoy more complete equity realization. It all comes back to what that little $56 raise means in terms of the LAG’s range, and how much of that range folds if we 3-bet. There are range assumptions where flatting is better than raising, but don’t talk yourself into flatting just because it feels the more comfortable play. Figure out what is the more profitable play. Look for bet-sizing tells to better constrain your opponents’ ranges. In the actual hand, Dan calls the flop raise and makes his straight when the 6d turns. He decides to check and the LAG checks behind. The river is the Ts, Dan checks, the LAG fires, and Dan shoves. Let’s first think about Dan’s check on the river. Would the LAG call a bet with 8x, but not bet it himself? I think it’s likely, which is important since 8x was part of the range we gave the LAG on the flop. In fact in this spot I’d consider leading the river for about $40 into $149. That may sound a little goofy, but here’s the idea. If the LAG wanted to bluff, why wouldn’t he fire the turn? Since he didn’t bet then, why do we assume a check will now induce a bluff on the river? However, if we fire for something goofy like $40, it might trigger the LAG back into bluff mode. The LAG will look at that tiny bet, decide that we don’t have a real hand, and thus that a big raise will force us to fold. It’s always worth considering these creative, non-standard options. They’re certainly not always going to be the best, and sometimes we simply lose value by getting into Fancy Play Syndrome, but against certain opponents taking odd lines can make us money. So do I think that the river check-shove by Dan is bad? No. I suspect it is sub-optimal simply because the way the hand played out I don’t think the LAG is doing enough bluffing here and will often check back. It turns out the LAG had one of the two combos of T8s and we lost. So what we do is take a note that this particular villain will make a small raise with top two on the flop and store that information away to use later against this specific player. The key takeaway here is to focus on the process of finding a +EV line, not the exact results of a particular hand. To help you with that, don’t forget to play around with the Red Chip Poker Fold Equity Calculator. You will also have noticed that the way I recommend playing the above hand relies on profiling our opponent, interpreting their raise size, and combining this information to put them on a range. These critical skills are all covered in my Live Workbook.